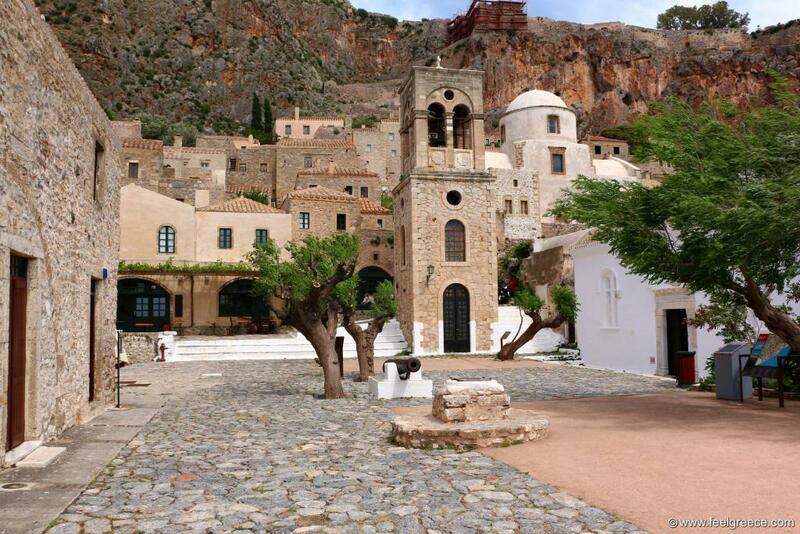 Single entrance - that is what Monemvasia means. A whole islet occupied by castle walls and fortress on the top, with only one gate for access. The islet has elongated shape with a large plateau, connected via causeway to mainland Peloponnese and thus the resemblance with Gibraltar. Once you step on it and pass through the castle gate, you will find yourself in a fabulous Medieval world with cobbled narrow streets and stone buildings. Kastro Monemvasia, as they call the fortified town, spreads from the top of the plateau down to the sea, forming small squares between the houses. Forget about cars and prepare to see only pedestrians and donkeys transporting luggage and laundry from the hotels. The fortress with the town inside its walls was founded by the Byzantines in 583 and for centuries it had existed as a rich and flourishing port. 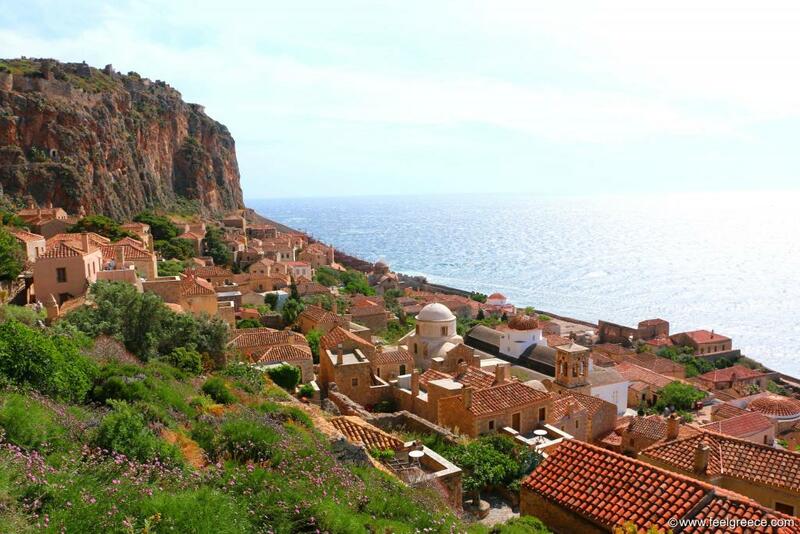 Since 11 century Monemvasia underwent periods of turbulent history involving pirates, Venetians, Ottomans and other rulers until it became part of Greece in 19 century. The causeway connecting the islet to mainland was built later to facilitate the access of tourists and locals. 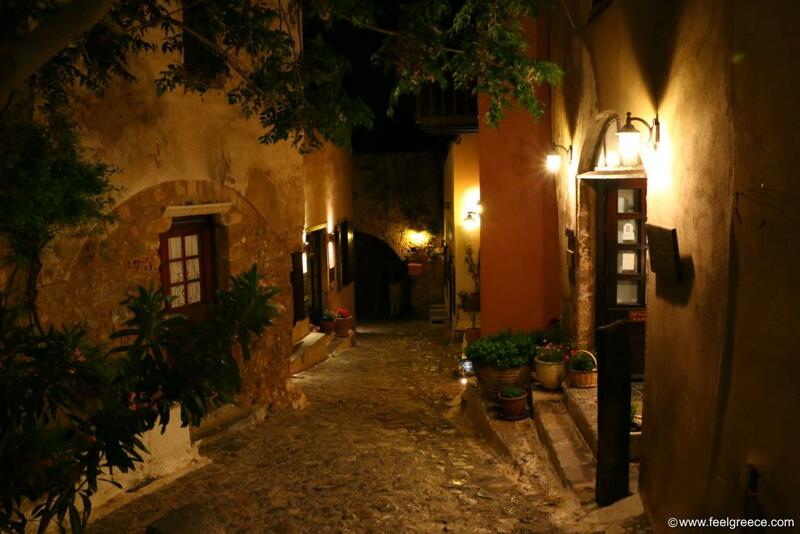 Now the town is a true open-air museum with boutique hotels, tavernas, cafes and some shops. Everything is well-maintained in its original outlook and there are no ruined or demolished buildings. The main alley from the gate is the commercial one, with small souvenir shops and a few tavernas. It leads to the largest square with a clock tower and church. 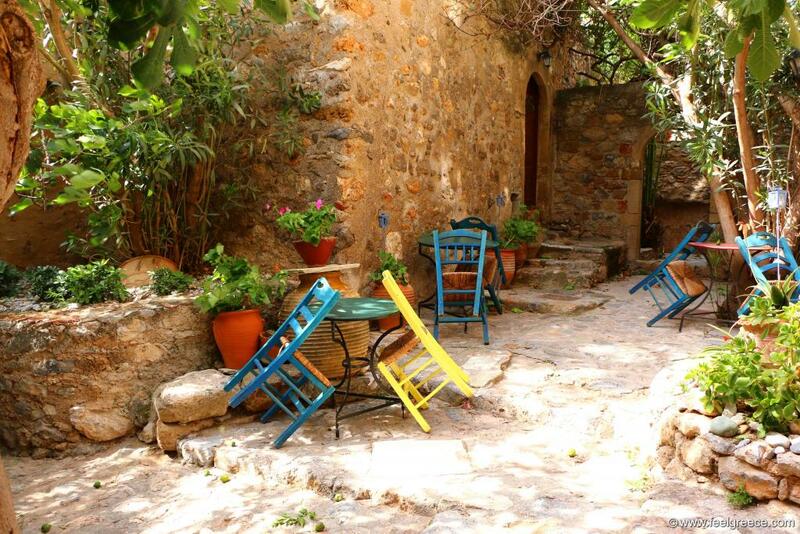 But do not spend all of your time here, it would be a pity to miss a walk around Monemvasia. Take the way up and discover Ano Poli, the Upper Town, with panoramic sea views and zigzag path to the top of the castle. Get lost in the narrow alleys with hanged lanterns and beautiful flowers, so tranquil and totally different from the busting city life. Then go down by the sea and explore Kato Poli, the Lower Town, where the waves splash against the castle walls. Even if there is no beach, some metal ladders are placed to enter the sea in calm weather, and the view from the Lower Town to the top of the castle and its plateau is no less stunning than vice versa. Here and there you`ll stumble upon hotel verandas where guests are quietly reading a book or enjoying a cup of coffee while staring at the blue sea. Hotel employees jump out of indiscernible side doors and noiselessly disappear in the neighbor alleys. Donkeys loaded with luggage carefully step on the cobbles and you need to make way for them and their guide because the alleys are not wide enough. 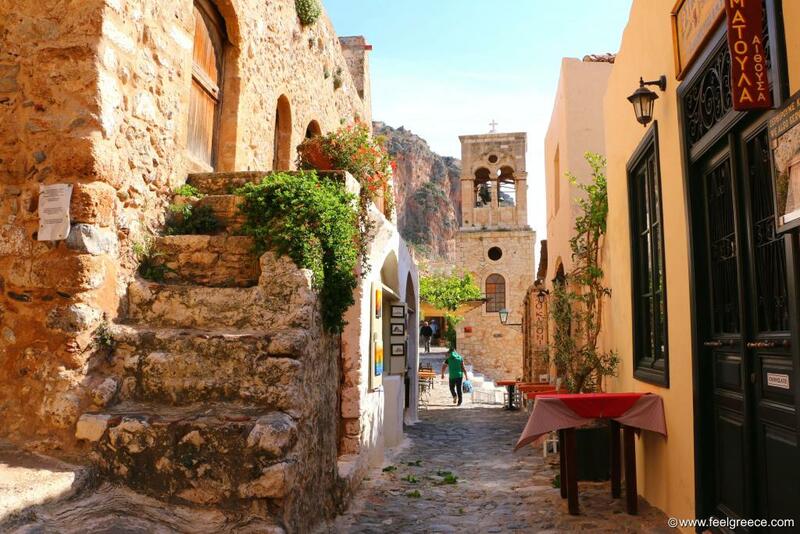 Time slips by unnoticed and suddenly you realize you have spent more than an hour wandering in Monemvasia, though it looks small and easy to tour. Now it`s time to indulge yourself in any of the tavernas around the square or at the roof-top traditional cafe near the castle gate. Have you considered accommodation here, you will have the opportunity to sleep in luxury rooms where past is still alive - all hotels have kept the atmosphere and furniture style of old times. And the evening walk across the alleys illuminated only by the lanterns is merely magical. 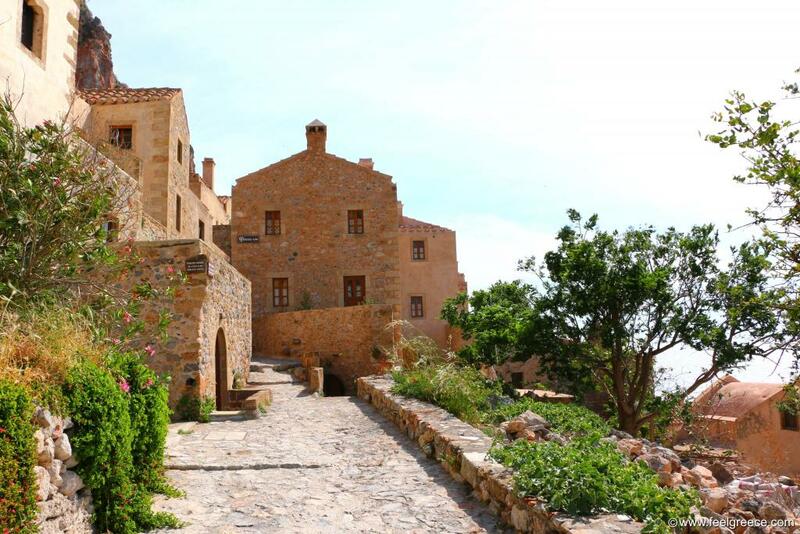 Do not miss Monemvasia during your Peloponnesian holiday, even for a day - it will enchant you!